Whirlpool is a reputed American brand providing all types of refrigerators. Whirlpool refrigerators offers a good versatility, delightful innovation, and a premium feel. Boasting 100+ years of experience, it is notably one of the few consumer durables companies to survive the adversity of great economic depression of the 1930s. Today it is a largest home appliance maker in the world. Talking about its India’s operations, Whirlpool entered the Indian market in the late 80s partnering the TVS group. Since then it rapidly expanded its operations and set up manufacturing units in Pondicherry, Pune, and Faridabad with headquarters in Gurgaon. Negligible competition from other multinationals and with the acquisition of Kelvinator India, Whirlpool was the market leader in refrigeration segment in the mid-90s. But when the east Asian companies like Sony, Samsung, LG entered the Indian shores, the leadership dynamics got changed. In the recent years, Whirlpool has thronged back in the appliances world by showcasing a robust growth and good acceptance amongst the Indian consumers. After Samsung and LG, it is third largest refrigerator brand in terms of revenue, with around 17% market share. Freshness is the key forte with the SealFresh technology in Whirlpool refrigerators. From the basic single door to the premium French door ones, all the modern Whirlpool refrigerators are equipped SealFresh technology which comes with an embedded smart processor inside, that senses, adapts, and regulates the cooling inside the refrigerator. Using this technology, refrigerator preserves the latent moisture of vegetables. An ambiance virtually mimicking the garden is created inside the refrigerator which retains the freshness of vegetables for up to 12 days. Similarly, it adapts the cooling to preserve milk and milk products for nearly 7 days. For those who don’t know, crisper is the bottom-most compartment of the refrigerator used for storing vegetables and fruits. Whirlpool offers a gamut of crisper types and designs. Double door models like Pro series comes with Fresh & Sort crisper wherein a mini-crisper is given inside the main crisper. This is done to sort the type of stored material. Fruits can be stored inside the mini crisper while rest of crisper can be stuffed with vegetables. This provides a separation of fruits and vegetables. In the single door models like Regalia, Whirlpool offers Trizone crispers wherein vegetables can be sorted into three different zones to maintain freshness and moisture for longer. This way even vegetables can further be sorted, and the intermixing of different vegetable odors can be avoided. Premium double door refrigerator like the IF series comes with Twin Seal crisper wherein there are two separate crispers for better segregation of food items. There’s nothing easier than pressing a lever to fill a glass with chilled water or fresh ice. Whirlpool’s high-end multi-door refrigerators offer this ease. They come with an inline automatic dispenser giving out water, cubed/crushed ice just at the press of the lever. By simply adding the water in a special compartment, dispensers of the French door refrigerator give out the crisp ice cubes. Also, users can select the amount of water needed, and the fridge will fill the container with that exact amount. Modern double door refrigerators from Whirlpool comes with Fresh Airflow technology which imparts uniform cooling through a strategically placed pair of flexible vents. It also allows the user to set the direction of cool air if needed. This way prolonged and uniform freshness for the stored item is delivered. Similarly, the side by side refrigerator from Whirlpool comes with 3D Airflow technology to ensure maximum air circulation, preserving the stored food. Premium French door refrigerators come equipped with Dual Cycle Dual Air (DDCA) technology which creates independent refrigeration zone in the refrigerator for a different set of food items to deliver highly customized and optimized cooling. This way it helps in preventing intermixing of food odors and thus helping to keep the stored food fresh. DeepFreeze technology is a part of Whirlpool’s famous 6th Sense technology, controlling the cold air movement in the refrigerator. The modern double door refrigerators come with vents placed at the back of the refrigerator which helps in creating a circular motion of cold air throughout the freezer. The main purpose is to ensure cooling retention even when the door is opened for usage. It also increases the pace of cold air generation and ensures cold air is fully circulated. This results in 40% faster bottle cooling and 50% faster ice making. Also, the cooling retention during power cut is improved 3 times than the ordinary refrigerators. Thus, DeepFreeze helps in retaining the taste and texture of the ice cream stored in the freezer. Most of the new Whirlpool refrigerators comes Microblock technology wherein an anti-bacterial filter is usually placed near the crisper shelves. They help in preventing the growth of harmful microbes and bacteria by up to 99.99%. There is also a freshonizer which reduces oxidation to prolong the freshness and deodorizer to keep the circulation of fresh air. New single door refrigerators from Whirlpool comes with patented Zeolite technology that helps in absorbing the ethylene gas released by vegetables and fruits to prevent excessive ripening. New series of direct cool refrigerators come with revolutionary insulated capillary technology. Ordinary refrigerators come with the capillary that provides refrigerant to the freezer which loses the cooling when exposing to the environment (upon door opening of the refrigerator) but the Whirlpool’s insulated capillary technology surrounds the capillary with the super cold gas. With this technology, the freezer achieves the cold temperature as low as -26oC. Insulated capillary technology helps to retain the freezer’s cooling even during the power cuts for up to 12 hours. Similarly, the double door refrigerators come with a chilling gel which stores the cold air and only releases it during the power cuts to ensure food remains cold and fresh for several hours. To put it simply, working of this compressor with inverter technology is similar to that of a car accelerator. When the speed required is more, the acceleration is more, and when it is less, and then the acceleration is less. For the faster cooling, this inverter compressor adapts its cooling to the load, maintaining a more stable temperature inside the cabinet with minimal temperature variation. This leads to a considerable decrease in the amount of energy consumed. Due to soft start nature and maintenance of low speed at steady state, users can see a considerable reduction in noise and vibration levels. Most of the modern Whirlpool refrigerators are well-designed to work even without the stabilizer. These refrigerators can work steadily without the risk of getting damaged due to voltage fluctuation. Also, if the voltage fluctuation exceeds the preset permissible limits, the power supply is automatically switched off, so it does not cause any harm to the refrigerator. Vitamagic series of Whirlpool refrigerators can resume its operation from a voltage as low as 80V and can stably operate without stabilizer even in high fluctuation, voltage ranging from 80V up to 270V. Similarly, Imfresh series of refrigerators can withstand voltage as high as 300V, for their stabilizer-free operation range being 130V to 300V. Whirlpool is a pretty reliable brand; but then it too has its pros and cons. When pitted against the popular refrigerator brands LG and Samsung, Whirlpool is arguably the quietest one around. Noise levels of its premium multi-door refrigerators is tantamount to that of a library, which signifies how quite they are. Also thanks to its eons of experience and efficient engineering, Whirlpool fridges can considerably reduce electricity bills using IntelliSense inverter and insulated capillary technology. Moreover, certain models also come with a Vacation Mode button that can help in reducing the energy consumption if the door is not going to be opened regularly. Interiors of most of the modern Whirlpool refrigerator comes with clear glass shelves, neat plastic drawers, and clean crispers. Crispers are noted to do an excellent job in regulating the moisture levels. Another good thing is that Whirlpool’s refrigerators are capable of keeping vegetables and fruits fresh for up to 12 days, thanks to its SealFresh technology. The downsides of Whirlpool refrigerators are few and manageable. Smart features like controlling the refrigerator through an app is missing even with premium multi-door refrigerators. The shelves quality of Whirlpool is not as strong as you would get in Samsung or LG. The heightened location of the dispenser in French door refrigerator could pose a challenge for short users. Whirlpool is one of the old and trusted brand when it comes home appliances. Whirlpool fridges are energy efficient, astonishingly silent and deliver a decent cooling performance. With the scientifically designed vents, the AirFlow system delivers uniform cooling throughout the refrigerator. DeepFreeze technology ensures that this cooling takes place faster. 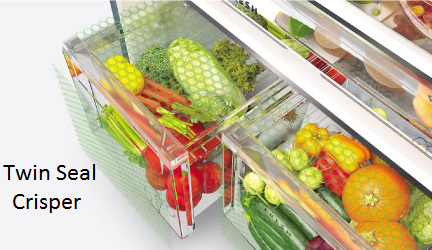 With TwinSeal crispers users can easily store and segregate vegetables and fruits and the SealFresh technology will make sure that stored item remains fresh for longer. Insulated capillary and chilling gel provide contingency cooling in case of power outages. 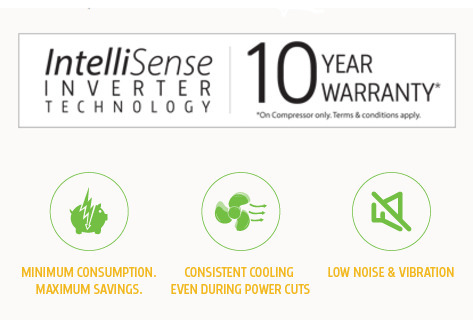 The best part being IntelliSense inverter compressor which by using the information provided by 3 sensors, smartly adapts itself to ensure optimal utilization of energy, leading to considerable savings in the electricity bill. Whirlpool refrigerators are noted to have consistent compressor cycle and freedom of odd spikes or dips in temperature. With an impeccable experience of 100+ years, you can surely opt for Whirlpool if you want an energy efficient refrigerator with best of features, multiple/dedicated crispers, all in a tight budget.